UNAIR NEWS – In the field of higher education, based on 2016 Times Higher Education, Australia has 16 universities at the top 100 universities of the world under the age of 50 years. About the cost of education, Australia is also affordable compared with the United States and universities in Europe. In fact, at those top-ranked university, the average tuition fee is less than half the cost of studying at top universities in the United States. Furthermore, based on 2016 Economist Cost of Living Survey data, cities in Australia are far from the most expensive cities in the world such as Singapore, Paris, London, New York, and Seoul. Seeing this potential, Universitas Airlangga discussed the opportunities of cooperation with Australia on Monday afternoon, April 9, especially about higher education. Being held in Rector’s office, 4th floor, Management Building Campus C, Rector of UNAIR Prof. Dr. H. Mohammad Nasih, SE., MT., Ak., CMA., meet the Australian Consul General in Surabaya Chris Bernes and staffs. There was also Vice Rector III Prof. Ir. Moch. Amin Alamsjah M.Si., Ph.D .; Director of Airlangga Global Engagement (AGE) Prof. Dr. Ni Nyoman Tri Puspaningsih Dra., M.Si . ; Director of Human Resources (HR) Dr. Purnawan Basundoro, SS, M.Hum . ; and other officials. Chris revealed that cooperation opportunities could be in forms of human resources, scholarship, and especially research collaboration. It could also include scholarship information, and student exchange programs. 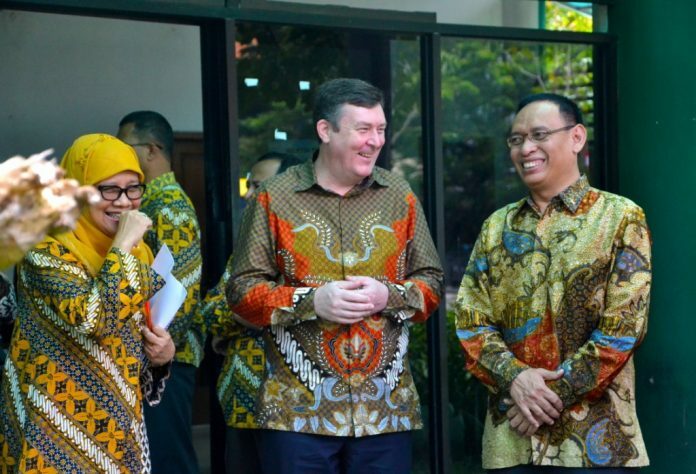 “Keep in mind, Indonesia became the number one tourist destination in Australia. So, Indonesia is so familiar, “he said. “Collaboration and cooperation of this kind must also be developed as well as reinforced,” he added in the discussion. On the other hand, Prof. Ni Nyoman conveyed that there is a great opportunity in field of lecture, scholarship, learning, and seminars. In addition, the meeting was also discussed about the establishment of Australia Banget Corner, a facility for the Australian consulate general office to share information on Australia, especially education, at UNAIR. “The areas of humanity and social culture are also opportunities for cooperation,” he said. “It was also discussed in relation to student volunteers involved in managing the Australian Banget Corner through activities programs,” he added.